This is a reblog of a post on my blog at gamemakeworld.wordpress.com. WORLDVIEW: Continual novelty and surprise in a warm, safe world. 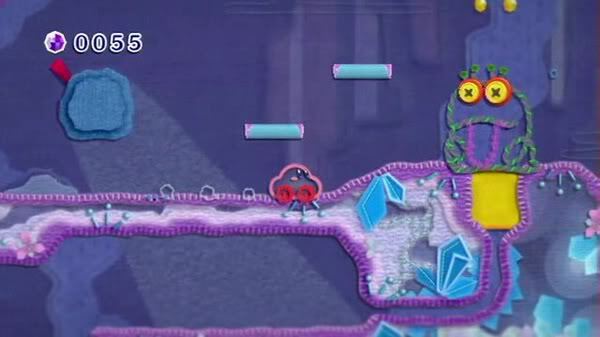 Many people have praised the game's unique aesthetic style and its ability to continually create new twists on the yarn theme. But what is really incredible is how yarn informs the worldview at every level and ties it all together. Yarn suits the warmth and safety of a world where it is impossible to "lose" or "die," and way that yarn can be unraveled and reconfigured enables the game's ongoing sense of novelty and surprise. There are eight Lands (Hot Land, Treat Land, Water Land, and so on), and the stages within each Land have a unique theme of their own (an underground stage, a stage in the woods, and a vine-themed stage, for example, in Grass Land). The game makes much use of the fact that yarn can be taken apart and re-formed. 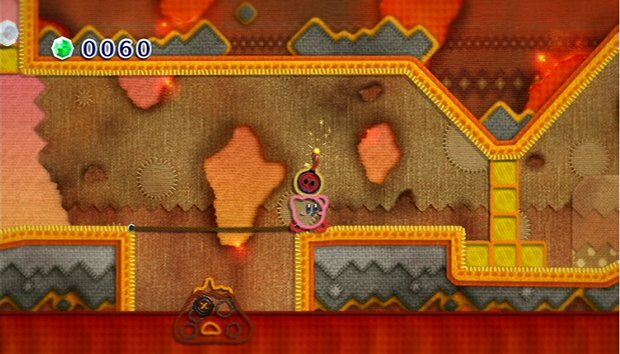 Backgrounds can be pulled together like a curtain to reveal hidden items, and enemies can be unraveled and turned into harmless balls of yarn (and then thrown at other enemies as a weapon). A simple string of yarn can serve as a platform, box, weapon, or shock of electricity, depending on its shape and color, while Kirby himself can stretch out into one long string of yarn in order to enter narrow tunnels. 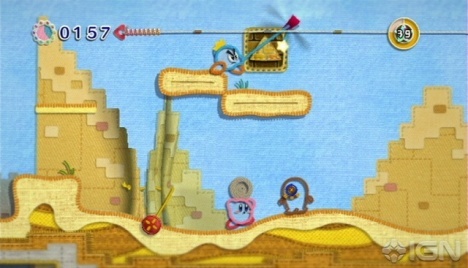 In this way the theme of yarn contributes directly to the novelty of each stage, both visually and in terms of gameplay. From the first stage to the last, the game never ceases to put a new and surprising twist on yarn according to each stage's theme. I particularly enjoyed the animations that play when a new stage is unlocked. Each is original, surprising and often silly. As with the rest of the game, the sheer imagination is impressive, and it is all made possible by the properties of yarn. 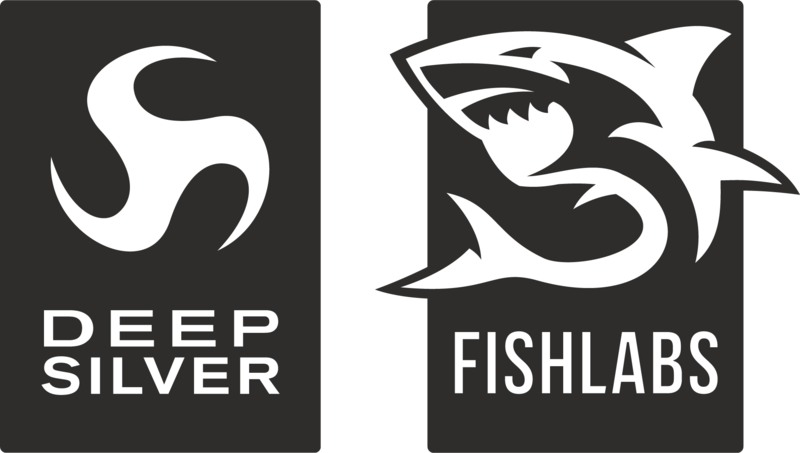 Beyond the names of each stage, which are playful and appropriate, there is very little text in the course of normal gameplay. 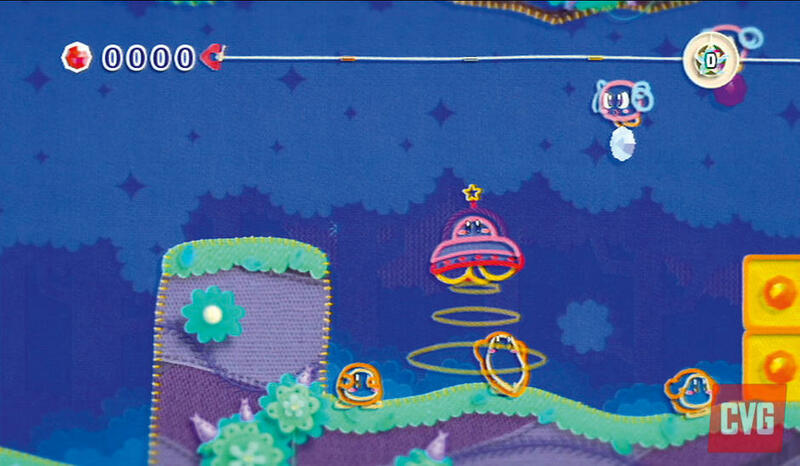 When all stages in a Land are completed, however, an animation shows the Land being connected to the next Land with yarn (thus allowing the player to advance), and there is a short cutscene with a voice-over by a narrator. The cutscenes are generally brief and tongue-in-cheek, featuring characters in tangentially related scenes. Beyond the stages themselves, various bonus features are found in Quilty Square. The shop-keepers and characters that manage mini-games here are very talkative, and fit game's cute, friendly style. Music is low-key, letting the visuals and gameplay take front seat, but a few tunes did stand out for me and really helped bring the level to life, such as Tube Town's song. Sound effects are also light and cute. The honking horn when your character turns into a car made me giggle on more than one occasion- something about the simplicity and absurdity of it was delightful. 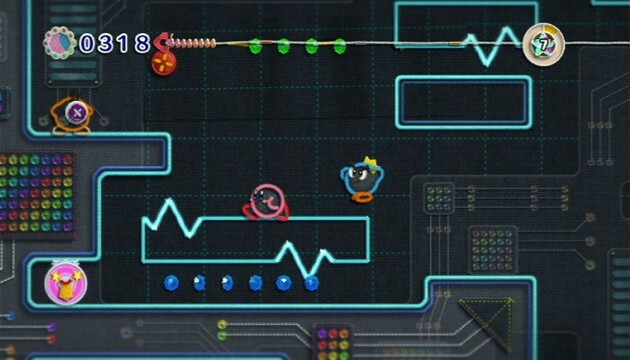 Controls are simple, mainly relying on Kirby's yarn whip. The whip is used to pull buttons, unravel enemies, and latch onto things to get to hard-to-reach places. There are also three basic transformations (a car, a weight, and a parachute) to deal with special situations (traveling faster, breaking through boxes, and floating down slowly), each delightfully responsive and endearing. 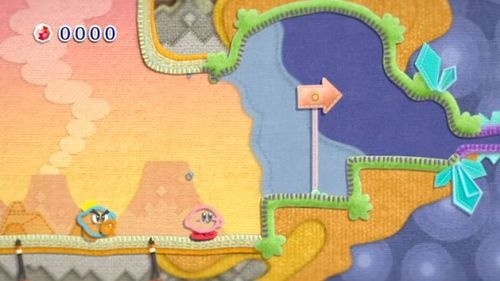 These basic controls are regularly mixed up with "Metamortex" areas where Kirby is unraveled and re-made into a train, UFO, or other object. 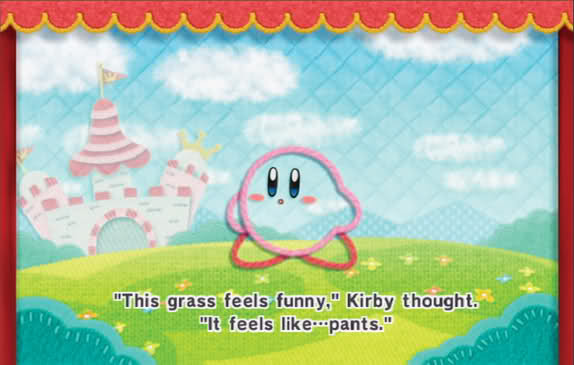 In these forms Kirby takes part in brief mini-games that are drastically different from normal gameplay. Removing timers and "game-over" conditions so that it is impossible to fail was a very bold move (though this creates the awkward situation where it is impossible not to win a boss battle), but it works well in the Kirby's safe and relaxing world. It gives the player a chance to enjoy the game's novelty and surprise without worrying about suddenly losing it all by dying. The adorable fact that almost every enemy can be incapacitated into a cute ball of yarn makes the game feel even more safe. The game goes so far as to have some enemies merely perform cute actions without harming the player at all (even if Kirby runs into them). Accomplishing the main goal of reaching the end of a stage is thus relatively easy and very low stress. However, there is also plenty of challenge in accomplishing the secondary goal of finishing each level with as many beads as possible in order to unlock items. Careful planning and quick responses are required to reach 100% completion, and there are more than a few places where you'll be on the edge of your seat. Metamortex areas are very hit-or-miss. Some, like the Train, can be a chore, while Star Shooter and even Fire Engine were a blast. Metamortex areas are thankfully sporadic enough that they are nice just to mix things up. Most of my major complaints come up in Quilty Square. One is the home decorating mini-game in Kirby's apartment using furniture the player collects. Furniture works like a sticker- you can slap it down anywhere on the image of the room and it just floats there. It's not even a mini-game as there is no real goal or much fun to be had. Pages upon pages of furniture and wallpaper can be unlocked and purchased through the course of the game, but it all feels a but excessive. Finally, I appreciated the light-hearted tone of cutscenes, but they felt unrelated to the rest of the game. The omniscient narrator seemed out of place and the events often had little to do with the characters and world I had been enjoying through the course of normal gameplay. Though amusing, the cutscenes did little to develop the worldview. Visuals: A unique yarn theme allows for continual variation and playfulness throughout the game while feeling warm and safe. Text: Minimal text serves the game well, but wordy dialogue in Quilty Square weighs the game down. Sound: Low-key, soothing background music works with simple and cheerful sound effects to let the gameplay and visuals take center stage. Controls: Simple and smooth controls are periodically switched up with various Metamortex mini-games. Rules: The innovative decision to remove all "game over" conditions allows the player to relax and safely enjoy the game-world's delights. How many games can be described as peaceful and relaxing enough to put you to sleep, while also being challenging, engaging, and richly imaginative? None that I know of, besides Kirby's Epic Yarn. 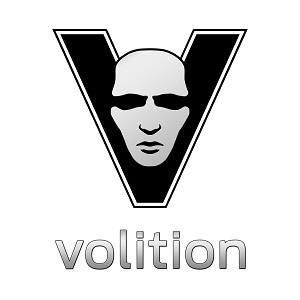 It stands out among games of its generation, and I think it creates one of the most original and solid game-worlds of any era.